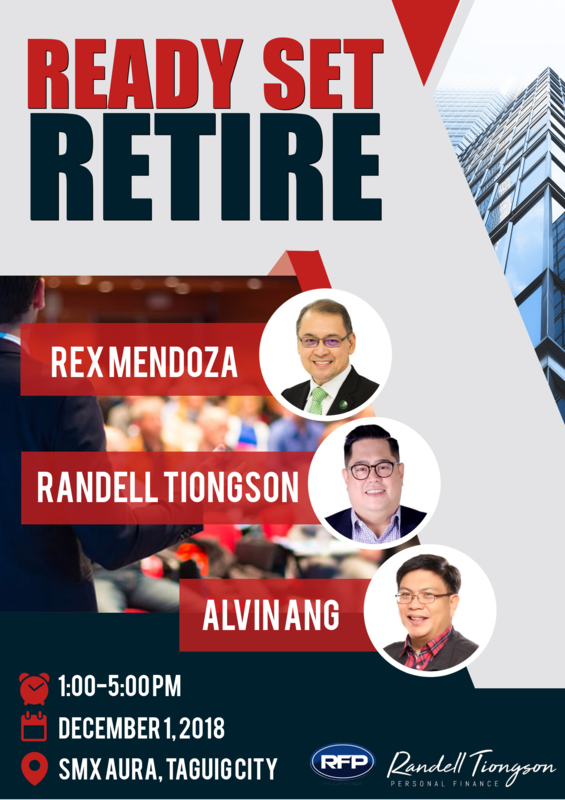 Did you know that less than 10% of Filipinos prepare for retirement? Despite the growth of the Philippine economy and the growing wealth of many Filipinos, preparation for retirement is still not a priority to many. Retirement planning is not rocket science but it requires a process and much understanding to find ways to properly prepare for it. Attend READY, SET, RETIRE! A No Nonsense Retirement Planning Workshop and learn how to properly prepare for your retirement. At the end of the half day workshop, you will be able to understand how to plan for retirement and what learn the tools that will give you a life you deserve. Find out how you can truly live a life of comfort & learn about the proper investments that is best suited for your needs objectively. Mr. Rex Mendoza is the President & CEO of Rampver Financials, a dynamic niche player in financial services specializing in investments, and one of the biggest distributors of mutual funds and other financial products in the Philippines. He sits as a director of Globe Telecom, Prime Orion Properties, Inc., Esquire Financing, Inc., the Cullinan Group, TechnoMarine Philippines, Seven Tall Trees Events Company, Inc., Mobile Group, Inc., and Trustee of the Bataan Peninsula State College. Rex is also a member of Bro. Bo Sanchez’ Mastermind Group, and is cited by many as one of the best leadership and business speakers in the country. He served as the President & CEO of Philam Life, one of the country’s most trusted financial services conglomerates and was Chairman of its affiliates and subsidiaries. Prior to this, he was previously Senior Vice President and Chief Marketing and Sales Officer of Ayala Land, Inc. He was also Chairman of Ayala Land International Sales, Inc., President of Ayala Land Sales, Inc., and Avida Sales Corporation. Dr. Alvin Ang, PhD is a professor of the Economics Department of the Ateneo de Manila University and a senior fellow of the Ateneo Eagle Watch. Currently, he sits on the Board of the Philippine Economic Society after serving as President in 2013. He was also the Director of the Research Cluster for Cultural, Educational and Social Issues at the University of Sto. Tomas. He has over two decades of professional experience in public and private sectors spanning development planning, policy formulation and analysis, investment research and economic forecasting, academic, consultancy and teaching. Dr. Ang is one of the most sought after though leader in economics. Attending this program will truly help you prepare for the future. The learning fee for this amazing program is only P3,500.00 per participant, a small fee that can give you exponential returns. Here’s some great news, if you register and pay before November 15, 2018, you can attend the program for only P2,000.00! E-Mail your screenshot or copy of deposit slip to [email protected] along with your full name and contact details.